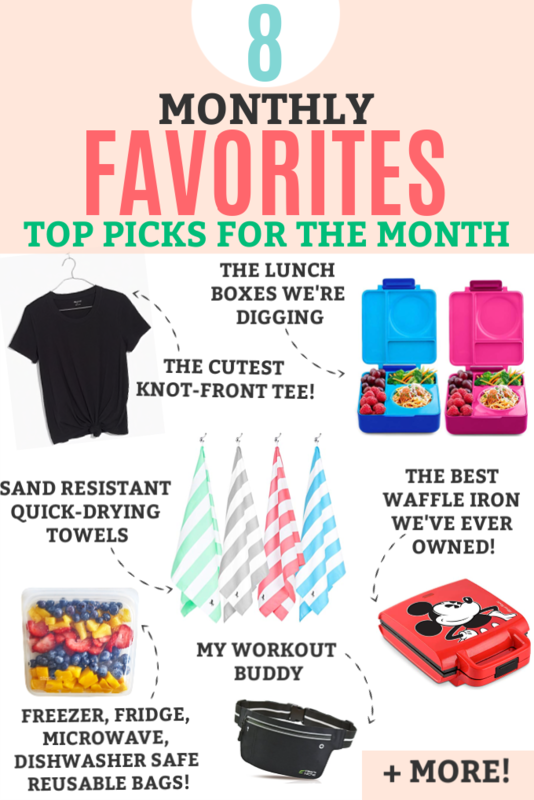 Monthly Favorites! 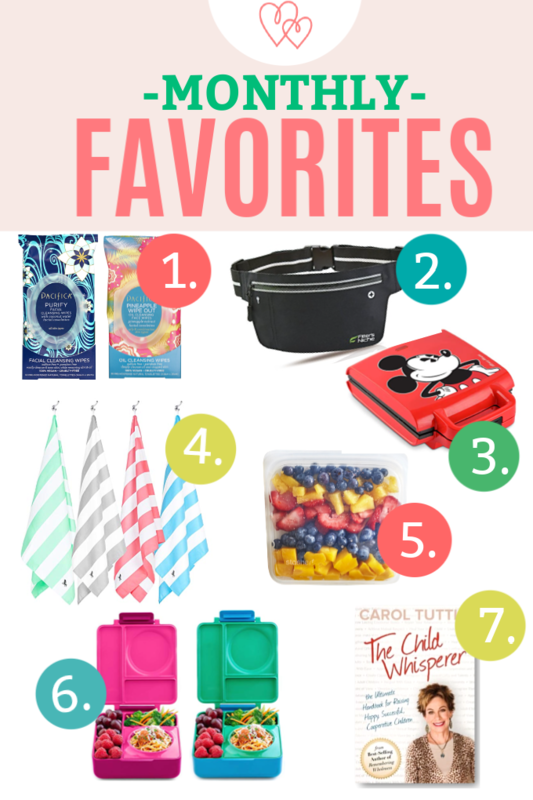 Our top picks for the month, including natural makeup remover wipes, the best waffle iron we’ve ever owned, the cute tee I’m loving, sand proof/quick-drying beach towels, kitchen picks, and more! It’s time for another monthly favorites post! This month was a big one for us–we wrapped up our summer vacation fun and both kids started school on Monday. (I know! School in July!) We’re on a modified year-round schedule, so we get extra long spring and fall breaks, which makes the early start totally worth it to me. I took these coconut makeup remover wipes on our trip this summer to get the first layer of makeup off at night (since I didn’t want to stain anyone else’s washcloths with mascara), and I REALLY liked them. I loved the coconut scent and felt like they were fairly gentle for makeup wipes. I can find them at Sprouts, Target, Ulta, and Amazon. Pacifica is a really conscientious brand–the wipes are vegan and cruelty-free, and made without parabens, phthalates, etc. If coconut isn’t your jam, they also come in other varieties, like rose water and pineapple. I’m excited to try those next! Errybody’s on the fanny pack train lately, which makes me laugh since they were SO OUT for much of my growing up years. I don’t wear one instead of a purse yet, but I do love this super slim one for exercising. I’ve been using a FlipBelt, which I still REALLY love (and plan to use again when the weather cools down), but found that for the sweaty summer months, it was making me SO hot! The fanny pack stays in place pretty darn well, even when I work up to a jog (ha!) and holds my phone (iPhone 7 plus) without any trouble at all. It’s not big enough for a whole giant ring of keys, but could easily hold 1-2, along with your gym or ID card. Laugh all you want, but I totally bought this Mickey waffle iron for Michael for Father’s Day. One of our favorite family memories ever was the Disneyland trip we took last October, and Michael and I just bough tickets to go around Christmas when all the decorations are up. We can’t WAIT! Try it with these overnight oatmeal waffles, gingerbread waffles, or berry waffles. We’ve been getting by with 3 very old (hole-y) beach towels for our family of 4 for the last many years, and this year, I decided to get some new ones. I did some research and found that microfiber towels are super highly recommended for being easy to clean, quick-drying, sand resistant, and light/compact for packing. I love all of these things. We got these ones from Amazon which came very highly recommended. It was a bit of an investment (vs. a $5 towel I could pick up from Target), but my hope is that they last a LONG time. So far, they dry quickly, and they’ve washed beautifully (we got chocolate out of Milo’s in a single wash with no special spot treatment!). They fold up REALLY small and packed beautifully for our summer trip, as well as pool visits and swim lessons. The only thing you might not love about them is that they’re not very plush. I was expecting the same texture as the microfiber washcloths we have, but these aren’t anything like that! The texture is smooth and flat (almost like suede), which is helpful for those with sensory issues. In fact, they were so thin and flat, I wasn’t sure they could possibly be very absorbent, but they ARE. They absorb a ton of water, dry quickly, wash well, and pack down super small. Highly recommend! I have a whole post coming soon about my favorite reusable bags and containers for the kitchen, but we have been LOVING these Stasher bags. We have them in sandwich size and snack size. They’re made of silicone (no BPA or plastic chemicals), which means they’re dishwasher, oven, freezer, fridge, and microwave safe. Seriously! You can use them to poach things or cook soux vide style, store cut produce in the fridge, steam veggies in the microwave, freeze smoothie packs, take snacks on the go, or reheat leftovers. We have used them for all kinds of things! I’ve got a big school lunch post coming soon with lots of ideas, as well as my favorite lunch gear, but if you’re also on the hunt, we’ve loved these Omie Boxes so far! We used them for about 3 weeks before school started to give them a test run, and now we’re wrapping up our first week of school. I’m sold! They’re a great size, they’re sturdy, they have an adjustable divider on one side, and a removable thermos insert that can be used for cold items (pasta salad, yogurt, etc.) or hot items (meatballs, rice, etc.). Sophie especially has loved the idea of hot lunch, and really wanted that to be an option this year. They’re a bit more of an investment, but the folks I know who have them have said they last well for years. PS – our other favorite are these Easy Lunchboxes which we’ve been using for 7 years. They’re tough to beat price-wise (you can get two 4-packs of Easy Lunchboxes for less than one Omie Box), they’re a great size, and they’re easy to clean, store, and open. My only issue with them is they don’t have a strong seal since they’re made to be easy to open. That means you can’t pack anything messy in them without a small risk of leaking, and there’s no real way to pack anything liquid (like yogurt, applesauce, soup, etc.) or warm in them without adding a second container or insert. I read this book a few years ago and remembered enjoying it, but got into a conversation with a friend about what “Type” our kids are and found I couldn’t remember at all. I got my own copy of The Child Whisperer, and (despite a somewhat hokey title) it’s a GREAT book! 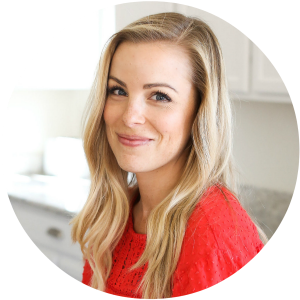 I love the in-depth ways she explores to work WITH your child’s personalities, and helping you understand some of their natural strengths and challenges. It was also helpful to see ways that MY personality type might impact my parenting and relationships. I’m going through this with a highlighter and totally recommend it. There are lots of great positive parenting techniques! I wear a lot of great basics in my capsule wardrobe, so I’m always on the hunt for a quality tee that’ll go with everything. I’m totally loving these knot-front tees. They look awesome with jeans or a skirt, and you can adjust the knot to hit right where it’s flattering for you. I can never successfully knot my regular tees without stretching them out or the knot slipping out 20 times throughout the day. These solve the problem! The front of the shirt is long and extended, shaped for knotting. Sizing wise, I’m usually between sizes at Madewell depending on the shirt. I went with the bigger of the two sizes, and it’s a nice flattering fit (not too tight, not too boxy). What do YOU love this month? Any favorites you want to share!? I’m all ears!